I have no shame for the things I do, and now I'm sharing them with YOU! I'm slowly getting back to South Park art, because for the past few weeks I was in a slump because some guy traced over my South Park crossover art and then that got noticed instead of my art. But I'm back! I'm slowly starting to make SP art again! Example, here's Seinfeld crossover art. Kramer was already in the show which means he's more accurate than the other three. Also, I made this thing last year and I still don't regret it. I have more art on my two deviantARTS (Lolwutburger, my old one and FluffyMystic, my current one) but I'm going to post more on this thread as I make more. It won't just be crossover art, though. I do canon character situations too! The Kramer is the best one to know who these four characters are. Seinfeld is second and then sorry but George and Elene are off. George’s face is wrong and so is Elene’s. Still I loved seeing these characters in South Park form. JamesPolo wrote: The Kramer is the best one to know who these four characters are. Seinfeld is second and then sorry but George and Elene are off. George’s face is wrong and so is Elene’s. 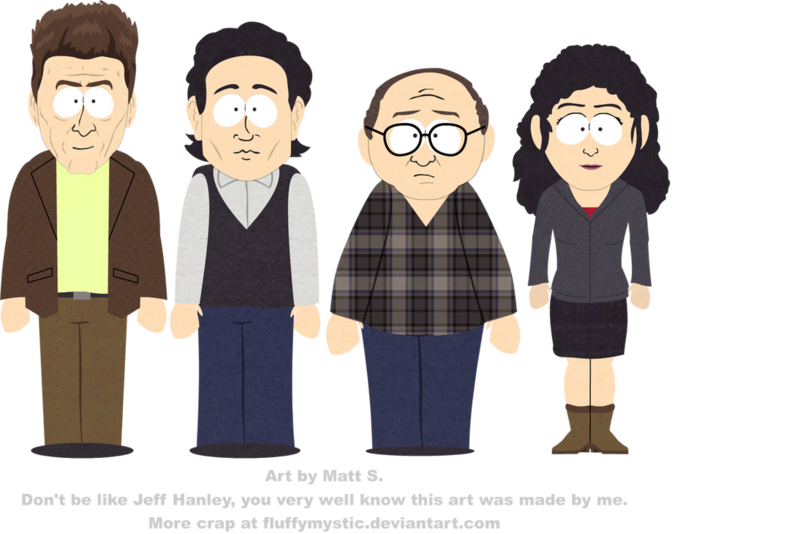 Still I loved seeing these characters in South Park form. Honestly, I agree. My SP style's still "stuck" in the early 2000's era of South Park, where everyone's drawn with not much detail. It's still better than what I did in 2014. Ohhhh, those drawings weren't really good.